Are you noticing the "high school" trend around here this week? I think we'll be set when our girls reach that point! This next resource I'm going to share with you is (I think) pretty unique. 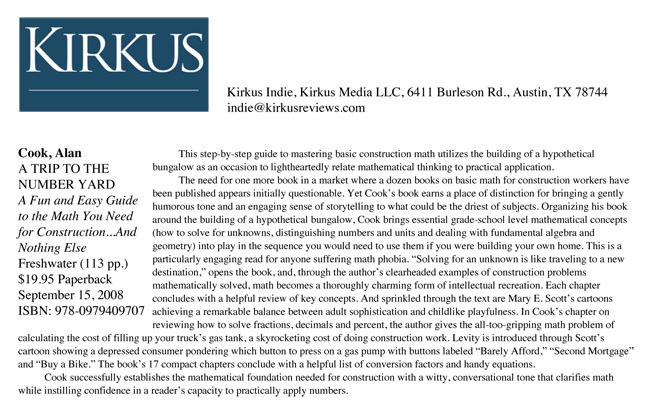 Originally written for adults who work in construction industries and need "remedial" math instruction, it would also be very useful as a real-life-skills math course for high schoolers – especially those high schoolers who are great with their hands but struggle with academics. A Trip To The Number Yard: A Fun and Easy Guide to the Math You Need for Construction…And Nothing Else is just what its title (and subtitle) claims. Taking the reader through the process of building a bungalow, it teaches the necessary math at each step of the process. The author, Alan Cook, says that middle school is probably the earliest that book can typically be used. It addresses a variety of math topics, including area, length, volume, multiplication, fractions and decimals, angles, problem-solving, and circles & pi. Because these skills are applied to problems like pouring concrete, calculating drywall and insulation, and solving plumbing questions, it can also serve as preparation for our young men in being "handy" around the house! Looking at the book overall, I find it fascinating – but overwhelming, so don't get ahead of yourself! Take it step-by-step, and everything clearly explained. Disclosure: The author provided me with a copy of the book above, to facilitate this review. As always, all opinions expressed here are entirely my own. People enter a trade field such as construction for various reasons: a lack of interest or inability to pursue so-called "higher education," a family business, or a genuine love of building. Many don't realize how essential basic math skills are to this profession, both to the technical process of gaining a contractor's license and in the day-to-day work that the job entails. And learning or brushing up on those math skills can be a challenge, since most college and adult math classes encompass so much that construction workers do not need to know. Alan Cook presents a solution to this dilemma: A Trip to the Number Yard. This handy little textbook is a primer for the math used by construction workers in their jobs. Topics covered include the so-called basics, such as determining area and working with fractions, to slightly more advanced concepts that readers will still find very useful, such as volume and calculating payroll taxes. All of this is smartly presented in the context of building a sample house so that readers can see exactly how this math applies to the job. The book includes diagrams to visually illustrate the concepts, as well as countless examples and samples of the math in action. Amusing illustrations by Mary Scott complete the book, providing a nice element of comic relief to lighten the reading. Cook's guide has great potential for construction workers of all types, both those who have been working the field for years as well as those just learning the trade. The information is provided in an easy-to-understand format; concepts are clearly explained, and sample problems walk readers through practical use of the math, step-by-step. Cook has put together a real winner here; this book has great potential for those in the construction field.